Meet with your expert licensed private guide in the heart of Athens, Syntagma square and start with a brief look at a lovely collection of archaeological findings dating from classical times and discovered during excavations in the area. Continue to the elegant House of Parliament to watch the Change of Guards done by the famous Evzones, in front of the Tomb of the Unknown Soldier. Walk through the cool and shady National Garden, the former Queen Amalia’s Garden and admire the neoclassical architecture of Zappeion Hall. Learn about the first Olympic Games of modern times and about prominent figures of Athens recent history. Visit the Zeus Temple and Hadrian’s Arch from the Roman Era. Walk along the beautiful Dionysiou Areopagitou walkway until you reach the side entrance to the Acropolis. Continue to the Acropolis by entering the site from the south slope, in order to visit the first theater of antiquity the Dionysus theater and to avoid the crowds. On your way to the Unesco-listed admirable Acropolis monuments, see the Philopappos hill monument and the Odeon of Herodes Atticus. Marvel the ancient beautiful constructions of the Acropolis: the Temple of Athena Nike, the Propylaea gateway, the Erechtheion and focus on the astonishing Parthenon. Your knowledgeable guide will provide you with plenty of information and uncover fascinating facts about the construction and history of the monuments. The unique, beautiful view of the city of Athens, including the Mars hill, the Ancient Agora and the Temple of Hephaestus, will capture your heart and mind, same as you will capture them on camera. 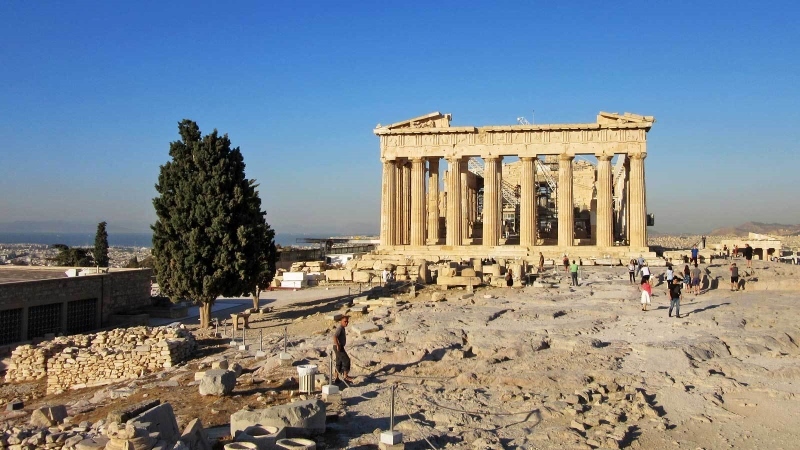 Time for exploring and picture taking at the Acropolis will be provided after your Acropolis tour and also a short break for a snack or a drink. After having admired one of the most famous sites in the world you can continue your tour to the Acropolis Museum. The New Acropolis Museum was designed by Swiss architect Bernard Tschumi in co-operation with the Greek architect Michalis Photiadis. Its unique design has incorporated the excavations which are visible under stunning glass floors. The Acropolis masterpieces are marked out and given the prominence they deserve through the ideal interior atmosphere conditions, the natural lighting, as well as easy visitor access, panoramic views and excellent layout of the exhibition areas. It exhibits about 4,000 artifacts. 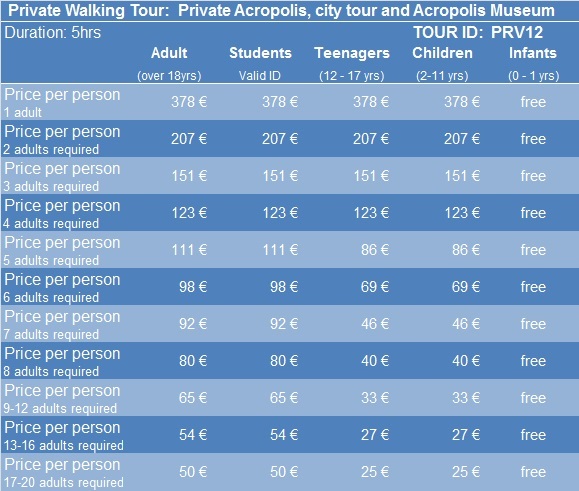 Admission fees for all places we visit during the Athens City Tour & Acropolis (Parthenon, Nike temple, Propylea, Erechtheion, Dionysus Theatre and Temple of Zeus) are not included in the tour's price. Prices of the entrance tickets are subject to changes without prior notice. On Good Friday (Greek Orthodox Easter) our tour starts at 10:30 am (not 09:30 am). The Museum is open daily (Monday to Sunday).